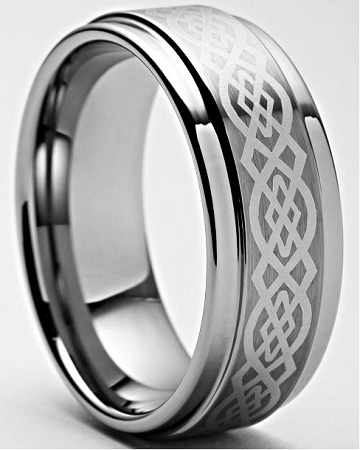 This stylish 8mm tungsten carbide ring features a Celtic Knot pattern along the center with rounded polished sides. Was this answer helpful? 59 of 64 Customer(s) found this Answer helpful. Q: How can I determine Male ring size? Was this answer helpful? 49 of 53 Customer(s) found this Answer helpful. Q: Is this a typical Celtic Tungsten Ring? A: That is correct. This Celtic tungsten ring is the traditional Celtic mens ring that you would expect for any Celtic Irish Wedding. Was this answer helpful? 32 of 35 Customer(s) found this Answer helpful. Q: What is the largest size you have? I'm not sure how to make out your sizes. I wear a size 14, but when I used your free ring sizer.....it did not even wrap around my finger. Are your sizes in a different measurement than the US? A: Hi Anthony, The largest size we have in stock in this ring is a size 19. The ring sizer we have only goes up to a size 13, so that makes sense. If you are a size 14, order the 14 and you will be just fine. We have plenty of those in stock and it will ship the same day you order. Was this answer helpful? 23 of 26 Customer(s) found this Answer helpful. Q: Do you have the Celtic style with the Celtic Dragon in continuable cessation around the men's ring? Don't want to miss sale, please get back to me today please!!! Thank you. Was this answer helpful? 18 of 21 Customer(s) found this Answer helpful. Q: Are your sizes the same for men and women? A: Hi Daisey, Unlike shoe sizes, ring sizes are the same for men and women. Hope this helps! Thank you, TF! Was this answer helpful? 16 of 19 Customer(s) found this Answer helpful. Q: can i get this in the gold? In the Fall of 2015, this will be available in Gold! They were on there way and it will be here before you know it! Thank you TF! Q: Will the imprinted design wear off of this ring? Does this metal scratch? Is there a warranty if either happens? Q: Does the keon celtic tungstun ring come in men and women mm's? Q: The description mentions that these rings are harder than titanium, does this mean they cannot be cut off in case of an emergency. I have a family member has a titanium ring and stopped wearing it when he found out it could not be cut off. Would that be the case with you Tungsten Steel if there was any problem that would prevent it from sliding off? P.S. The Keon Celtic ring is gorgeous! A: Yes. Most hospitals and clinics have medical equipment that will break off or snap a tungsten ring in an emergency. It is true that they are one of the hardest materials on the planet, but that being said, they can be cracked and broken off. Q: Do these bands come in his and her sizes and styles? Both my husband and my wedding rings were looking pretty beat after 20 years. I bought the Keon Celtic bands for us. We love them.The feel of them on our fingers feels like good quality rings..Waiting for them to come out in gold. Customer service and all the people I spoke with were very kind and ready to serve. I love my ring!!! I loved the ring and it came in so quickly. Unfortunately I ordered a size too small so I sent it back for a size 9. I'm very glad I purchased these celtic tungsten rings, when I first got them, both were the wrong size, completely my fault, and they exchanged them quickly. Very beautiful rings, and great customer service. I have purchased 7 of these Celtic design. Now every male in the family has one and it gives us a unifying feeling similar to a Scottish Clan...the rings are beautiful, eye catching, always a conversation starter. Just ordered #8 for a daughter, same design only thinner width. AND did you ever see the price that the "Big Name" jewelry stores charge for these? Got this ring @ 15 yr anniversary mark right to replace my first wedding band (all gold, and kinda beat up, I'm a bit hard on rings) I was a little skeptical about going with a Tungsten Carbide ring but not only do I love the weight and feel of it the ring itself it really does look modern and striking. I'm getting another TC ring from these folks in the near future for the other half. After the first one its a case of "Shut up and take my money!" When I need again I m gonna by you guys.thank you. My husband purchased this ring so that he would have another wedding to wear and change out for casual and outdoor activities. It's absolutely gorgeous and the quality is superb. It has a rounded comfort edge so he can wear it without having a square edge digging into his finger. It has a beautiful brushed and polished finish; very masculine looking, but also shouts out to his Celtic heritage. We would highly recommend these rings to anyone looking for quality Tungsten. Bought this ring for my upcoming wedding. It was shipped fast. It arrived in a nice black velvet ring box. My husband to be likes the ring as well. I ordered the ring on a Friday and received it tge following Friday, amazing shipping time! The quality of the ring was impeccable, it has a good weight and looks better than pictured! I do need to return it as I ordered it in the wrong size but I'm confident that the return process will be just as good as the ordering and shipping was! The ring is very good. I am very satisfied with the purchase. Shipped promptly and came on time. This was a replacement ring for my lost wedding ring and now my wife wants the matching ring. Beatifully made with craftsmanship of amazing perfection!?? Love! I ordered an 8mm Mercury, and I love it. The facets really capture the light and give the impression of fluidity. Just for fun, I took a steak knife to my ring: not a scratch. Very cool! The shipping was very fast. The ring is a nice weight and smoothly finished. The pattern is a little more understated than it appears in the picture online, which I like. I recommend shopping with this company. Excellent quality and excellent value. I was extremely pleased with my purchase. As a side note I must comment on the superior customer service. I am happy with the ring so far. I did return it because I messed up on the ring size. I like it because of its style and boldness. Rings looks and feels great, I ordered size 10.5, which is my regular size but the rings was too tight, so I returned it for a slightly larger size.....I am currently waiting for the new ring to come but I am absolutely sure that I will love it.....and will wear it all the time.